It’s still early Friday morning, but Agripas Street is already wide awake. 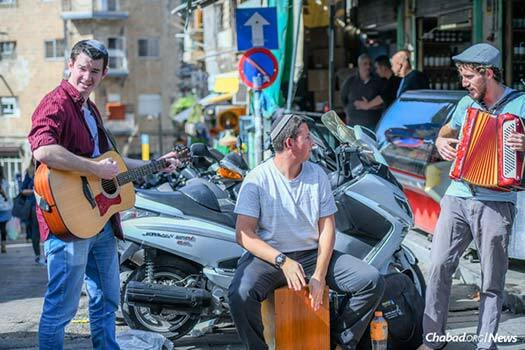 Those staying in town for Shabbat are rushing to the historic Machane Yehuda market (also known as the shuk) to buy food, challah, wine and other staples for the day of rest. And those leaving the city are rushing to the central bus station nearby to get to places all over Israel before the buses stop running an hour before sunset. Although Machane Yehuda Street is closed to automobile traffic, it’s even more crowded than Agripas. A river of people from around the city and the world courses between the various merchants and buskers that line the open-air market. On one corner, one small roaster is slowly churning out handfuls of candied cashews. Their sweetness fills the air for blocks, though it is occasionally punctuated by the scent of freshly baked bread being wheeled through the streets in 8-foot-high stacks. There is a Chassid with long peyot (sidecurls) and a headset microphone singing over pre-recorded backing music. His puppet, dressed to match him precisely, is “singing” along with enthusiasm. A coffee shop overflowing with customers has little tables that jut out into the street. At one, two older men sit together in silence reading their newspapers. At the next table over, four soldiers in uniform, weapons on their laps, are also sitting together, all looking at their phones. Despite the din in the street, the coffee-shop manager is alert to every muffled slurp. The second the last of the latte foam has been sipped, everyone must get up! There are other customers waiting. The Kippah Man is selling . . . kippot (skullcaps) . . . of every imaginable size and color, along with various Judaica. Bob Marley, living forever on dozens of T-shirts, waves from across the street. There are beautiful tablecloths for sale and plastic covers to keep them that way. Spices—in all the colors of autumn in New England—rise into precarious peaks in metal bowls and burlap sacks at the edge of many shops. There is a lady in a white headscarf selling bundles of fresh herbs. 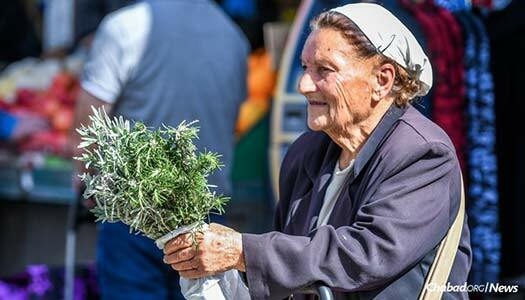 Maybe she picked some from her garden, if not from the ubiquitous rosemary bushes that line Jerusalem’s streets. 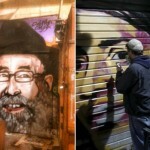 Across from her, under a late-winter sun that has become quite bright, where HaEshkol Street intersects Machane Yehuda Street, are the modest umbrella and two small tables that make up Chabad of Machane Yehuda. On the tables are a stack of packaged Shabbat candles, inspirational and informational pamphlets, and eight pairs of tefillin. Tefillin are the black leather boxes containing biblical verses worn during daily prayer for thousands of years. On this Friday, five young yeshivah students help Jewish men and boys put on tefillin and say the prayers. 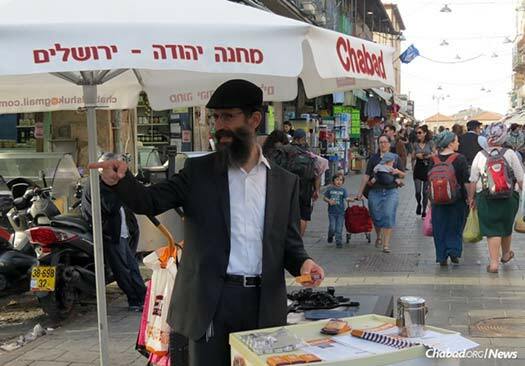 Rabbi Tzvi Ruderman, co-director with his wife, Nechama, of Chabad of Machane Yehuda-Davidka, says on most weekdays at least 100 men put on tefillin with him in the market; but on Fridays, it’s more like 500. 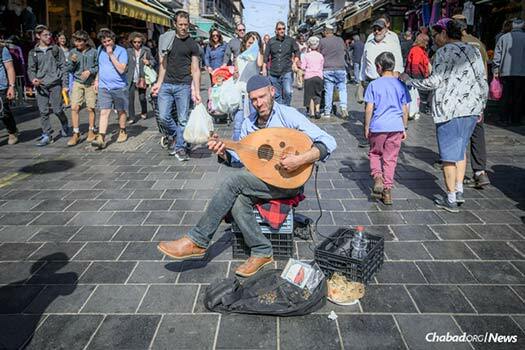 He and his wife have been working with visitors and residents of the Machane Yehuda neighborhood for the past six years, ever since she suggested that they move the stand from its previous location in the fashionable Mamilla Mall. 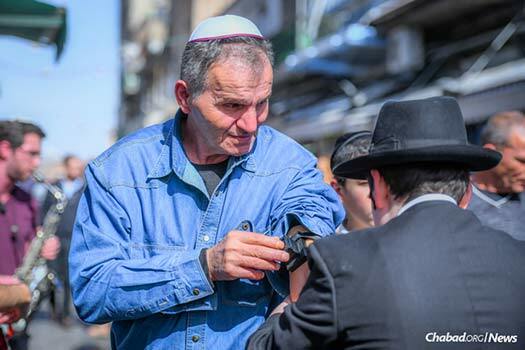 On this Friday morning, more than 25 people have put on tefillin at the stand in rapid succession—men of all ages, with different occupations, who were born or live on many different continents. Michael is from France and works in Tel Aviv. 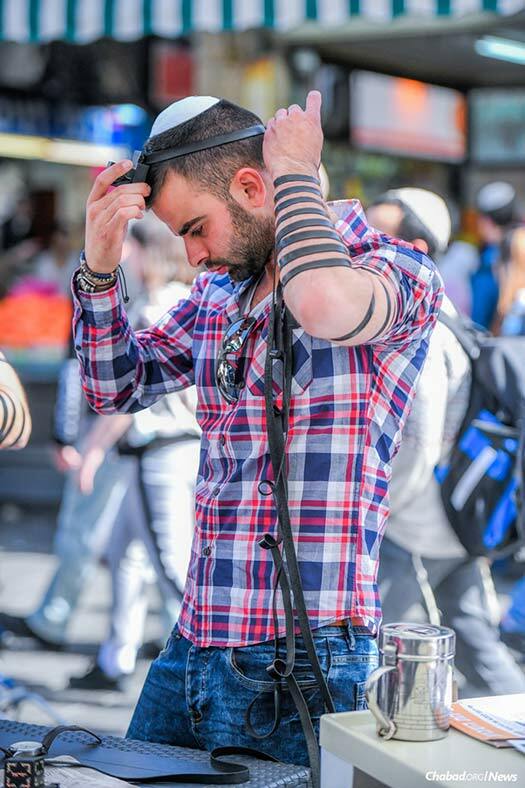 He generally doesn’t wear tefillin, but his girlfriend—standing close by—suggested he try it. Yeshivah student David Blau, 14, helps him wrap the long straps around his arms and hands him a card with the prayers printed on it. 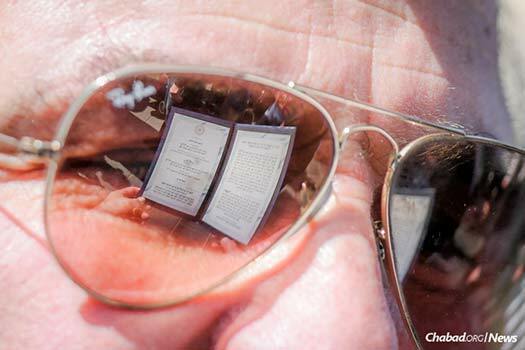 In the bright sun, the Hebrew letters “Shema Yisrael” reflect off Michael’s sunglasses as he gazes down at the card. Shmuel is an Israeli glass worker. He gets his tefillin on with the same rapid ease that he does every day. “Thank goodness for Chabad,” he says. He’s been traveling for work and forgot to bring his with him today. As he finishes wrapping the straps around his left hand, someone stops to tell him his headpiece is on crooked. The stranger helps adjust it. The two men smile, shake hands, and the stranger slips back into the crowd. This kind of encounter, says Ruderman, was the vision of the Lubavitcher Rebbe—Rabbi Menachem M. Schneerson, of righteous memory—who prior to the Six-Day War in 1967 launched a campaign to enable more Jewish men put on tefillin. The Rudermans are still carrying out the mission 51 years later. 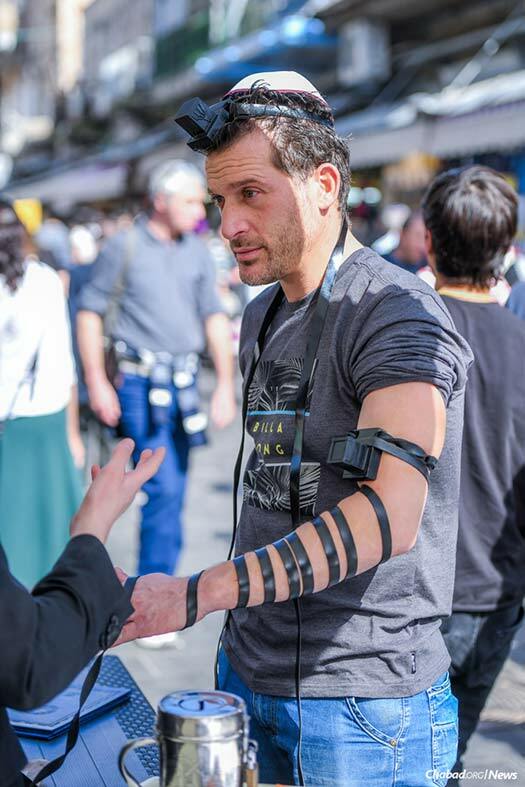 “The spiritual comes together with the physical,” the rabbi explains, both of putting on the tefillin and the pulse of the market all around him. More people are coming by to ask the rabbi’s advice or have a laugh with him. A woman with an artistically shaped, peroxide-blonde hairstyle and bright red heels asks Ruderman if she can take some Shabbat candles. When he says yes, she thanks him and slips them gingerly into her bag. In between interactions, he coaches the students, gets water bottles for thirsty people and plans upcoming holiday programming. On Purim, there were readings of the Megillah (the Scroll of Esther) every hour in a tent on nearby Jaffa Road, and the rabbi was there distributing treats and explaining the mitzvahs of the day. 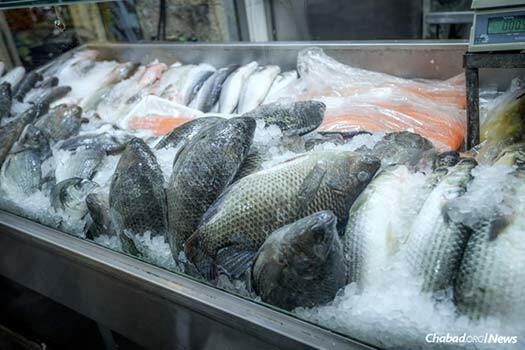 For Passover, the Rudermans will host a massive Seder in a hall near the market. 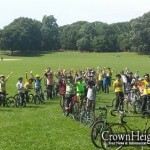 And he wants to build a permanent Chabad center, where all this and more can take place. “Tell the readers it’s an emergency project,” he shares joyfully. Next to the Chabad stand, a band is setting up. There’s a drummer, an accordion player and a guitarist. They open with “Shalom Aleichem,” the traditional melody for the angels of peace that come into every Jewish home on Friday night. As they play, shouting is heard. The vendor nearby can’t hear his customers’ orders over the music. Could they quiet down, please? They maintain a lower level for the next 15 minutes or so. Then the saxophonist shows up. It’s only his first time playing with them, but their chemistry is great. A crowd closes around them when there is more yelling from the stall across the street. Another vendor can’t hear. They jam a little more softly for the next 30 minutes or so before packing up and looking for a more hospitable spot. 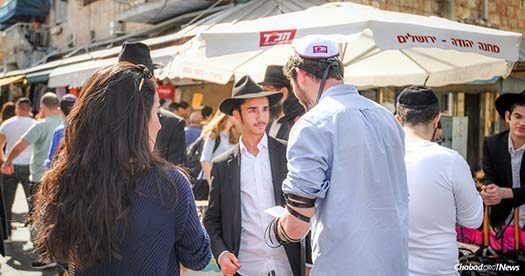 By 1 PM the market has gotten even more crowded, and yeshivah students who have to get home to Beitar are replaced by a new group of students who live in Jerusalem. A Canadian couple stops to chat with the rabbi. “Do you need a place for Shabbos?” he asks. They’re visiting family, so they’re set, but still very grateful for the offer. 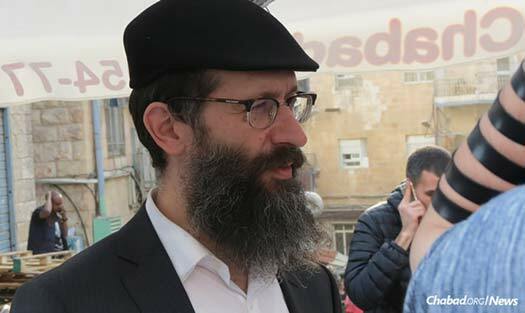 Before the siren sounds for the onset of Shabbat, Ruderman will have found 20 to 30 people on that Friday in the Machane Yehuda market to share the Shabbat meal in his family’s home nearby, just as he does every week. Such nachas to the Rebbe. Bringing Moshiach now!